The Omlet Ltd Eglu is a brand of chicken coop marketed in the UK. The Eglu is intended for small-scale, backyard chicken keeping. The original design was created by four graduates from the Royal College of Art. Omlet Ltd was founded in 2004 by James Tuthil, Johannes Paul, Simon Nicholls and William Windham. The company's introductory product, the Eglu, has won a number of awards, including the BSI Design Award and the Horners Award. It comes in several colours, and features a run of 220 centimetres (about 7 feet). The Eglu itself is roughly 80 centimetres (2 feet, 8 inches) long and wide. The company also sells models designed for use by rabbits and guinea pigs. Since its founding, Omlet has grown into one of the largest chicken house and pet retailers in the United Kingdom. The company is based in Wardington, Great Britain, and sells to customers worldwide including the U.S., Germany, France and Holland. ↑ "Hoover's - OMLET LTD Marketing Contacts". Siegle, Lucy (November 7, 2004). "Fresh way of life sweeps suburbia". The Observer. Retrieved 2008-04-10. Jeavens, Christine (24 May 2004). "Eggs and the city". BBC News. Retrieved 2008-04-10. Fleming, Nic (June 26, 2005). "The latest in urban chick...a five-star coop". The Telegraph. Retrieved 2008-04-10. Iggulden, Amy (April 10, 2004). 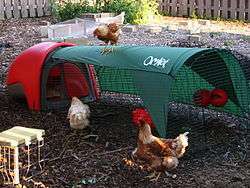 "Chic coops to house urban chickens". The Guardian. Retrieved 2008-04-10. Smith, Lewis (April 10, 2004). "Urban hen coop for the designer chic". The Times. London. Retrieved 2008-04-10. New Jackets for Hens Solo and Princess Layer; BBC News; accessed . Reflective Chicken Jacket Will Protect Your Pet Cluckers; KING5.com; Seattle; accessed . What Did the Chicken Wear When It Crossed the Road? ; GA Daily News; accessed . Wikimedia Commons has media related to Eglu.